Jerry Sandford, a successful touring entertainer, travels to London with his young daughter Peggy. After being spotted by producer Eve Barry whilst working the provincial theatres, he is moving to London to work in a new revue show called 'London Town'. After years of constant moving between rented flats, working in small theatres and dreaming of stardom, he hopes this job offer will be his big break. 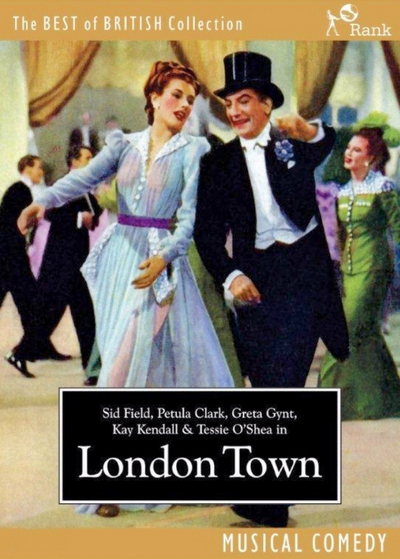 Songs in London Town include "You Can't Keep a Good Dreamer Down", "The Ampstead Way" (most definitely inspired by "The Lambeth Walk" from the earlier stage production Me and My Girl), "Any Way the Wind Blows", a medley of Cockney songs ("Knock 'em in the Old Kent Road"/"Any Old Iron"/"Follow the Van"), "Don't Dilly Dally on the Way" (sung by Charles Collins), and "My Heart Goes Crazy," which was the title under which an abridged U.S. version of the film was released by United Artists in 1953.